Put snowshoes on at 3500', snow pack was a bit thin lower down in the brushy areas. Followed the road (Snoqualmie Lake Trail and then the Quartz Creek Trail) to about 3500'. From there the terrain basically guided us toward the southern ridge. Originally had wanted to go the west ridge, but there was a creek crossing that looked unpleasant. Aimed for the saddle at about 4500' on the southern ridge. From there continued north, then east to the summit. The summit block in the summer would be a class 3 rock scramble. In winter conditions, it may not be possible to reach the true summit. We did some "mixed" scrambling on icy rock and were able to carefully make it to the summit. 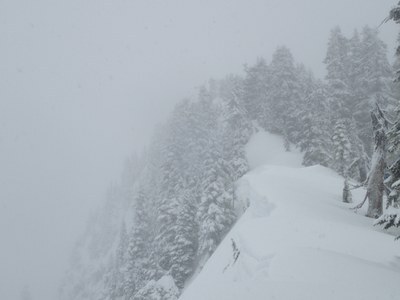 Certainly there would be great views from the ridge and the summit, but on this day we were in a complete whiteout. Much rainier/snowier than expected.